The Maudgil Brahmins in Jodhpur believes that they are the descendants of Ravana. They are planning to install an idol - showing Ravana as a worshipper of Shiva – at Navgraha temple on Fort road in Jodhpur. Legend has it that Jodhpur is the maternal home of Mandodari, daughter of the king of Mandore, ancient capital of Marwar. 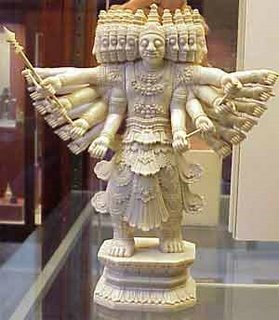 Mandodari was the wife of Ravana. Ravana is considered to the the son-in-law by Namdeo Vaishnav Samaj here. The Maudgil Brahmins came to Mandore from Lanka during the marriage. They shifted to Jodhpur when the city was founded in the 15th century. They claim that their ancestors have been performing annual Shradh (death ceremony) during Dasara. Pinda Daan is also offered annually during the period. There around 150 Maudgil Brahmins in Jodhpur. There is a altar here known as Ravan Kin Chanwari at Mandore - the people here believe that Ravana Married Mandodari on the altar.